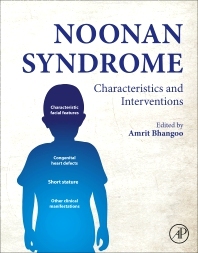 Noonan Syndrome: Characteristics and Interventions provides an in-depth analysis on this disorder that pediatric endocrinologists and primary care clinicians can use to make sure they provide affected patients with an updated model of care and appropriate treatment. The book examines recent advances in understanding and treating short stature in Noonan Syndrome, along with the latest progress in growth hormone-dependent signaling pathways involved in short stature, one of the most frequent clinical manifestations. Chapters also address how patients with Noonan Syndrome undergo more than average surgical procedures and have a great bleeding risk. This must have reference for pediatric endocrinologists and practicing physicians will give them all the information they need on the topic. Dr. Bhangoo is a pediatric endocrinologist with nearly a decade of experience teaching medical students, pediatric and pediatric endocrinology residents, as well as endocrine fellows. He is currently a senior editor on Endocrinology, Diabetes & Metabolism Case Reports and has served on editorial boards of Journal of Pediatric Endocrinology and Endocrinology and Metabolic Research. He has also served as a reviewer on multiple journals including Pediatrics, Clinical Endocrinology, Journal of Clinical Endocrinology & Metabolism, Endocrine, and the European Journal of Endocrinology. He has contributed book chapters to the Textbook of Pediatric Endocrinology (Taylor & Francis), Pediatric Adrenal Diseases (Karger), and Genetic Steroid Disorders (Elsevier.) He is recruiting authors from pediatric endocrinology, pediatric cardiology, genetics, pediatric urology, anesthesiology, hematology and pediatric gastroenterology.